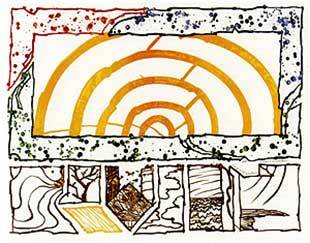 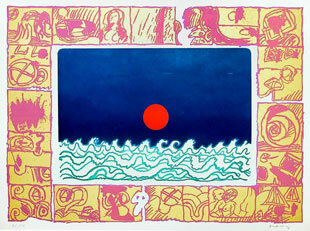 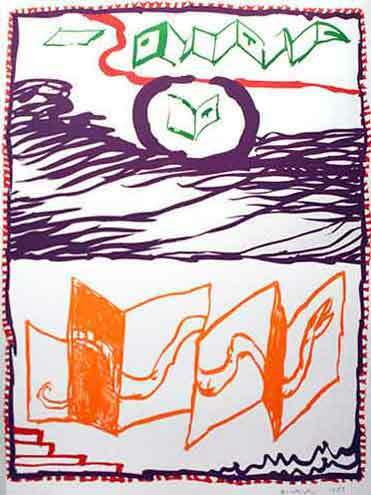 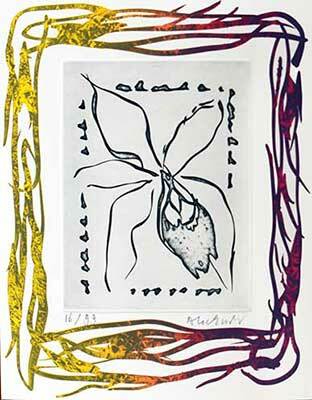 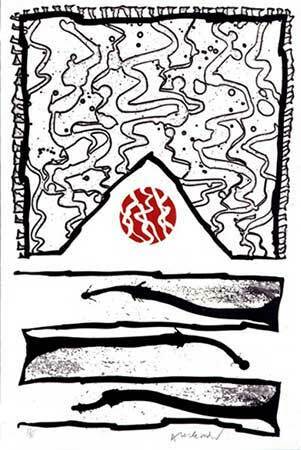 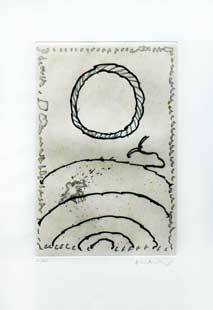 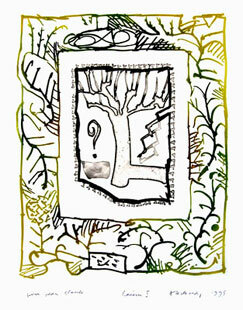 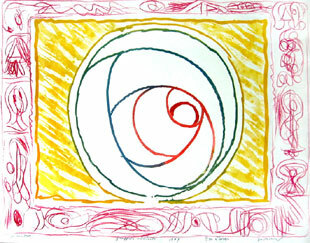 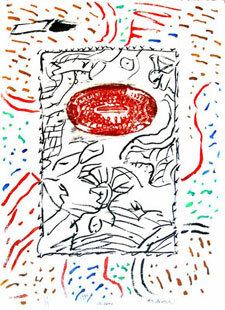 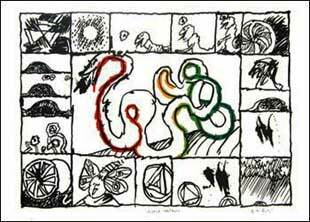 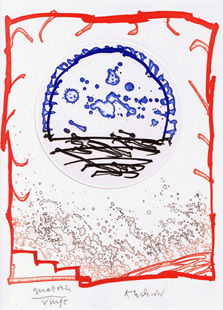 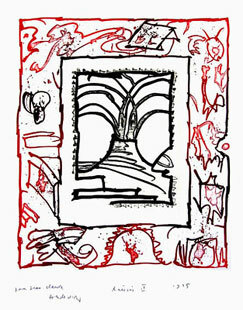 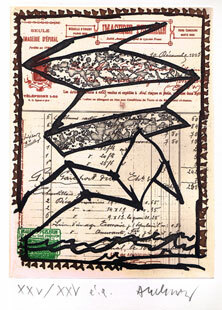 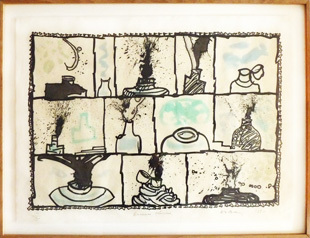 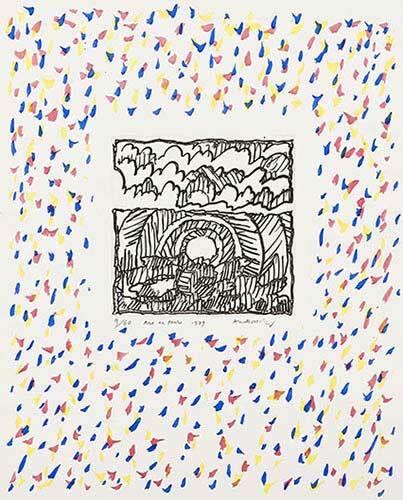 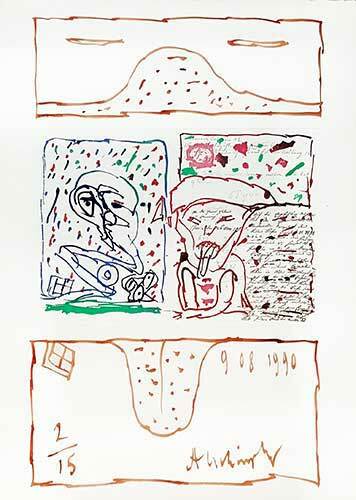 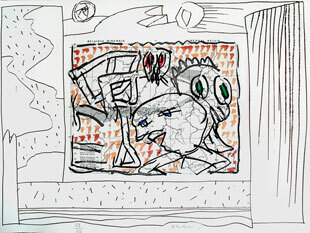 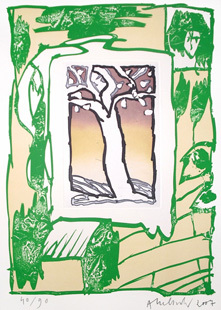 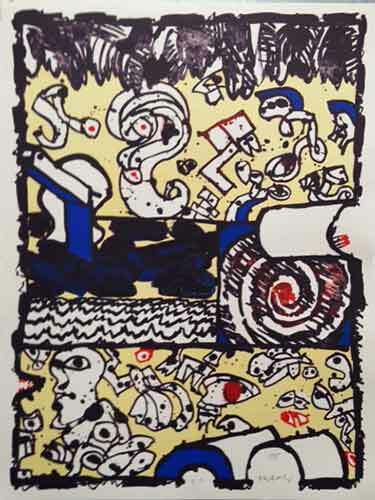 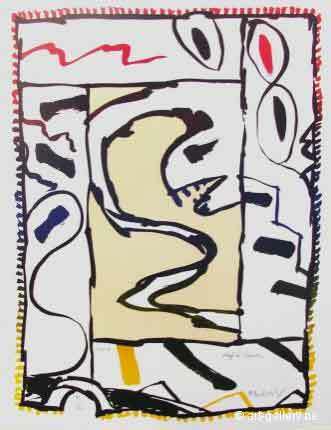 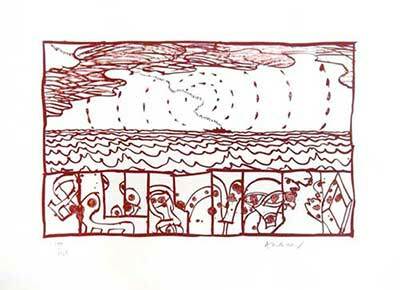 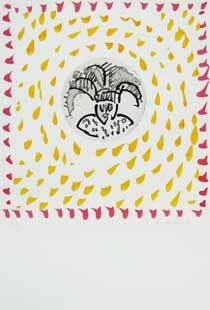 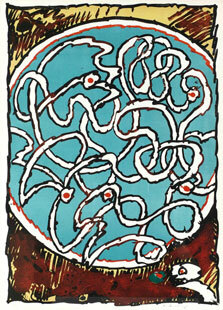 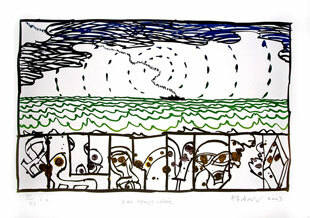 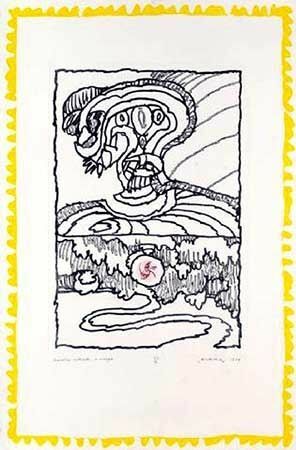 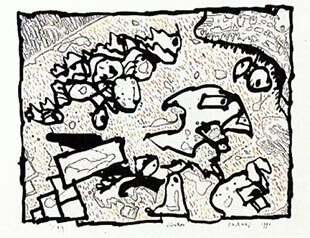 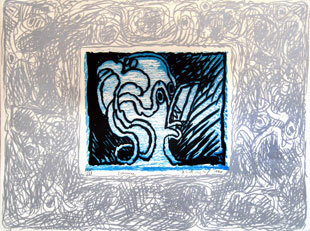 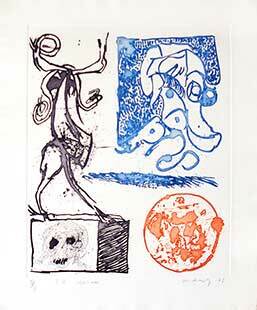 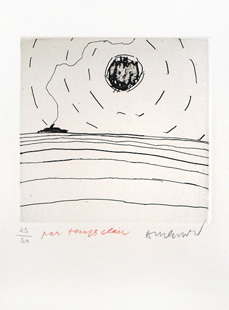 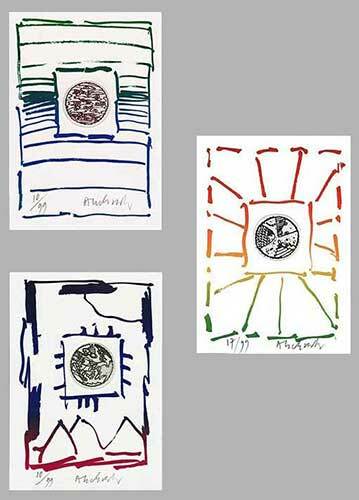 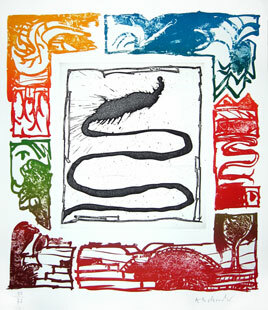 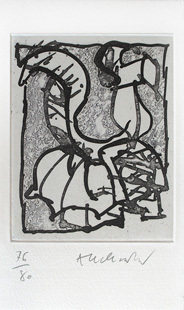 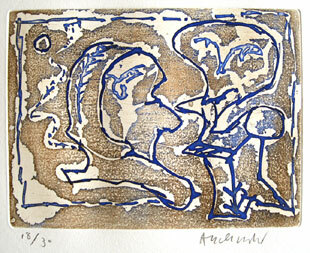 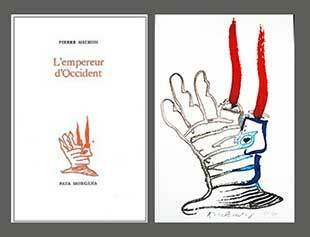 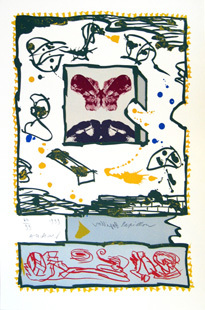 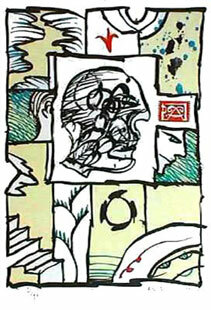 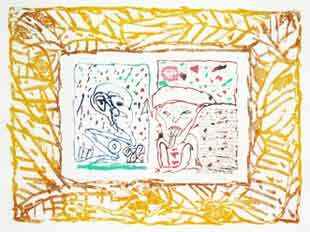 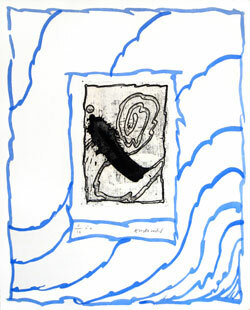 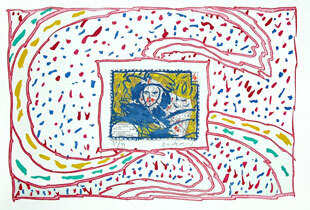 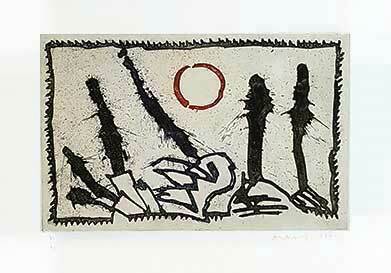 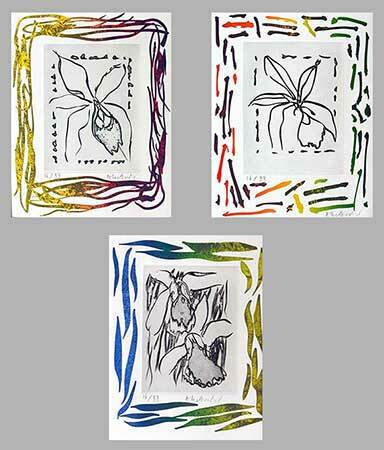 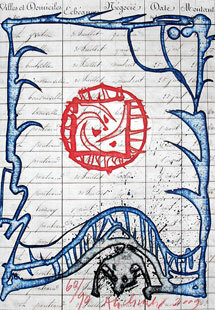 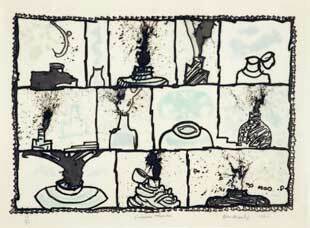 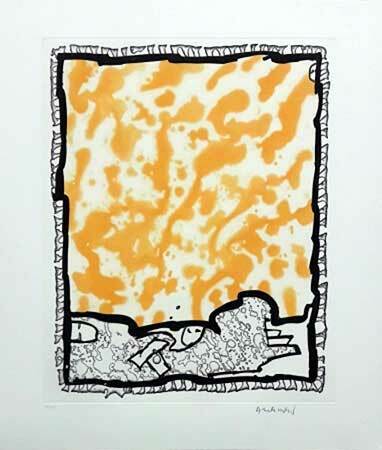 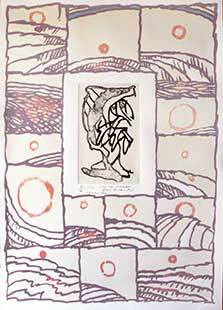 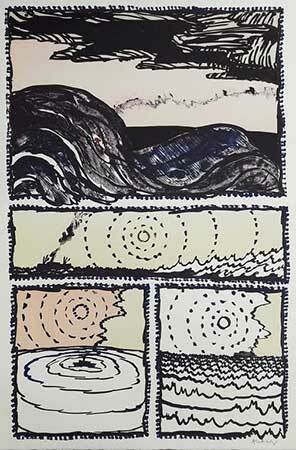 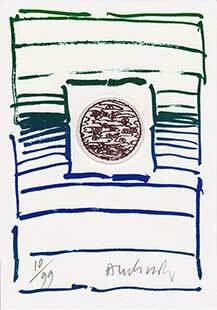 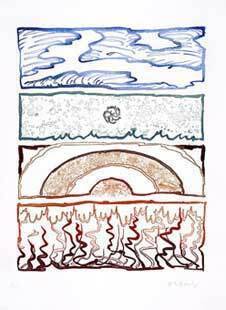 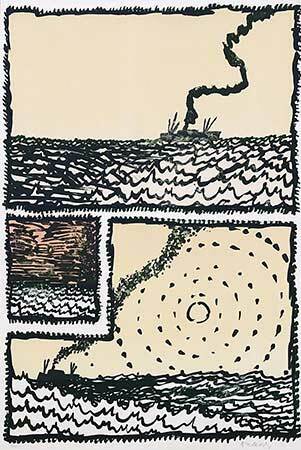 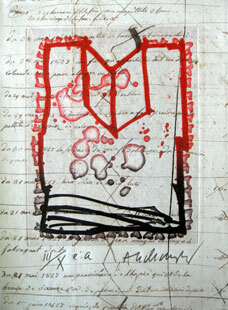 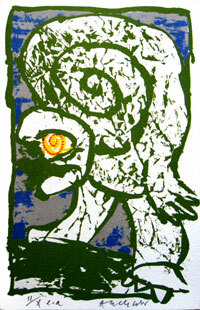 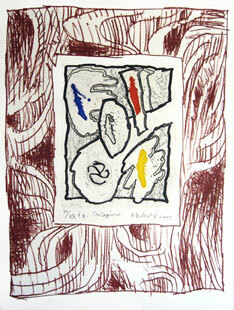 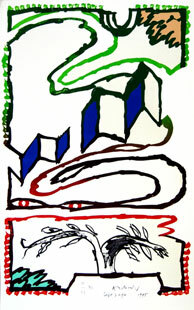 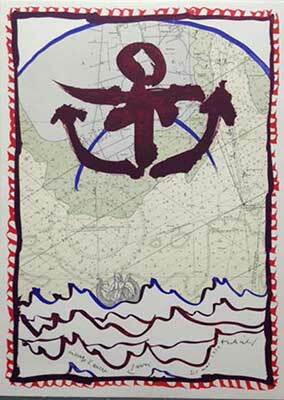 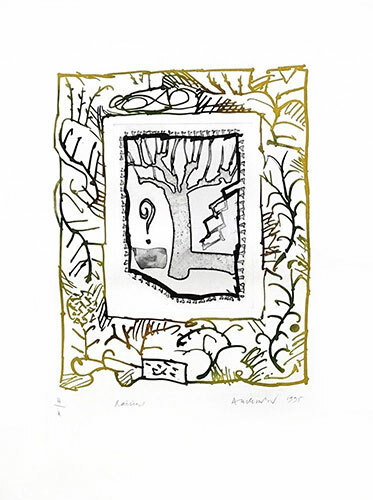 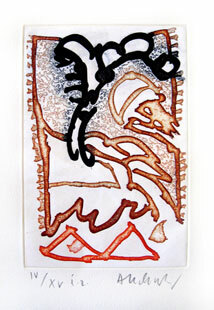 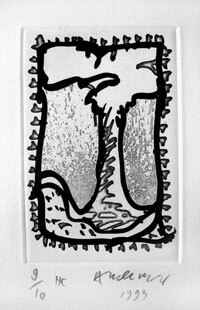 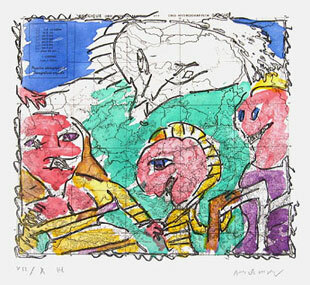 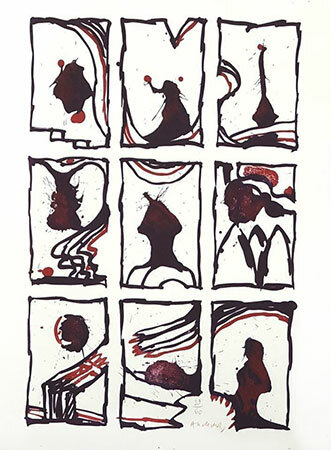 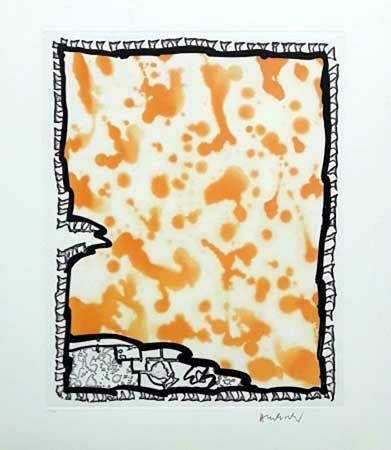 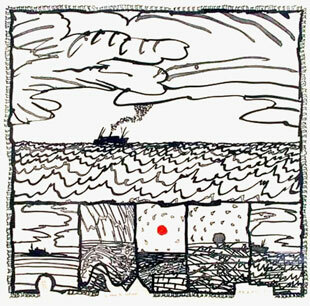 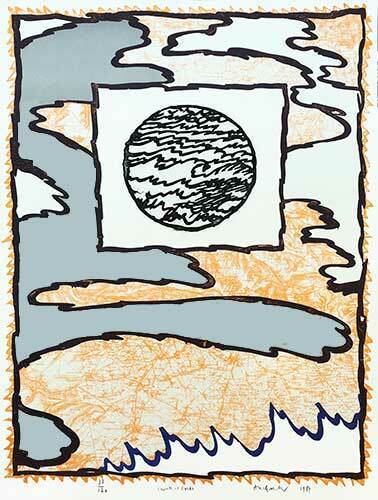 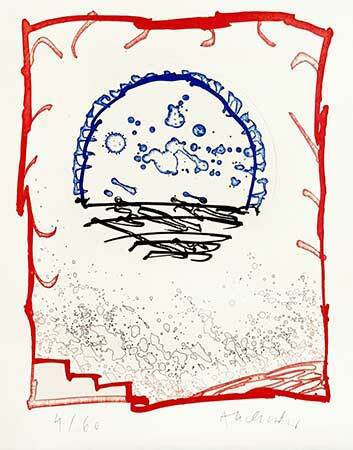 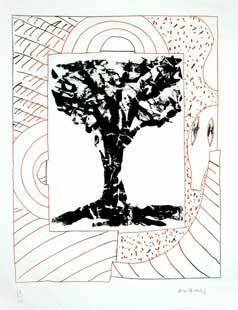 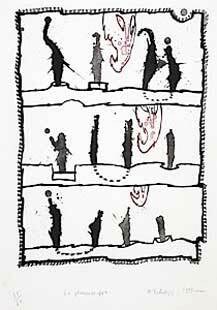 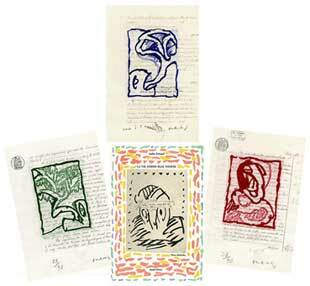 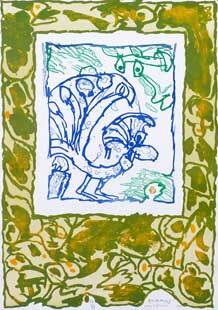 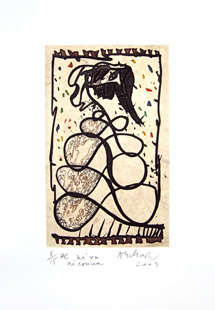 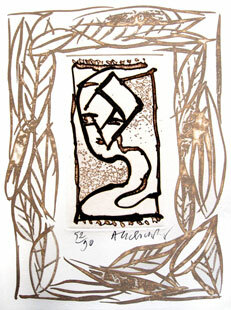 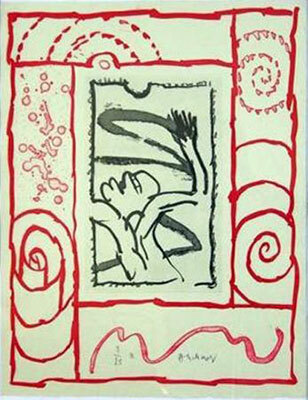 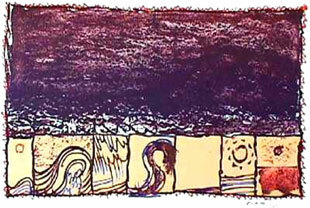 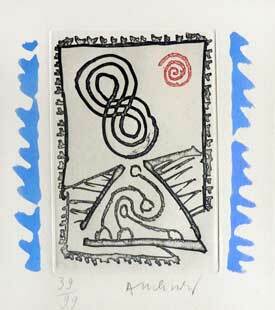 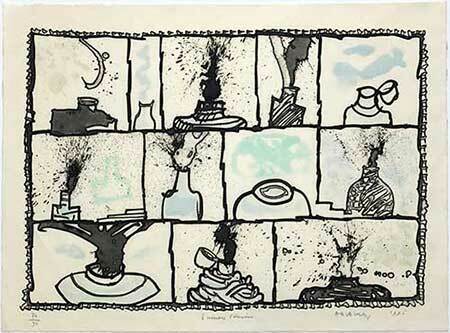 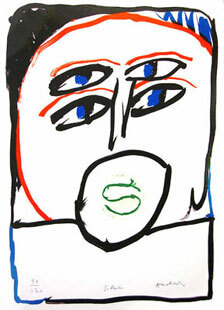 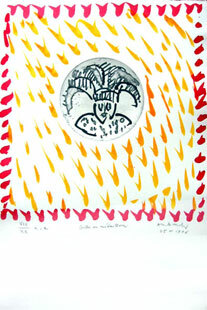 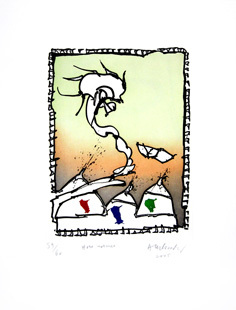 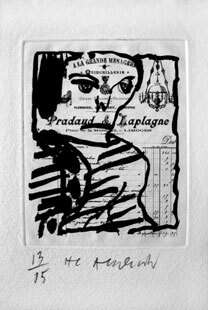 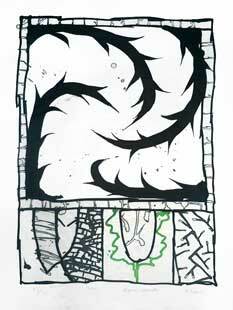 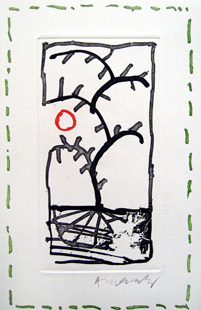 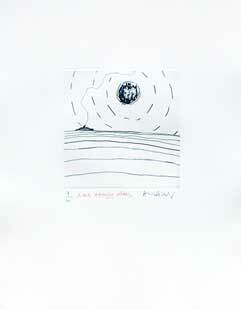 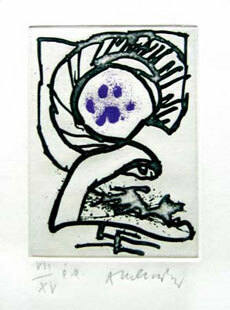 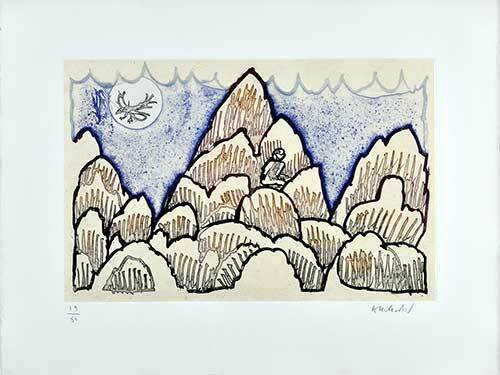 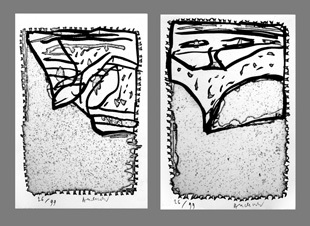 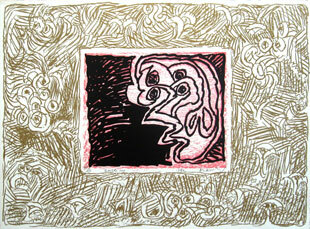 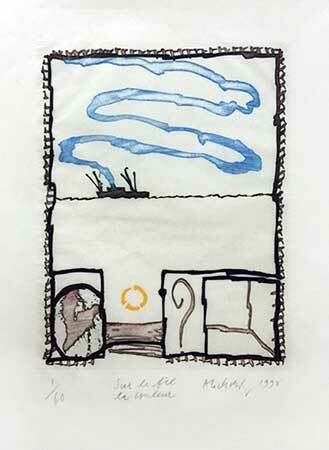 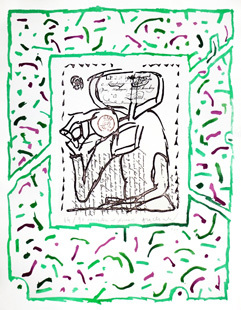 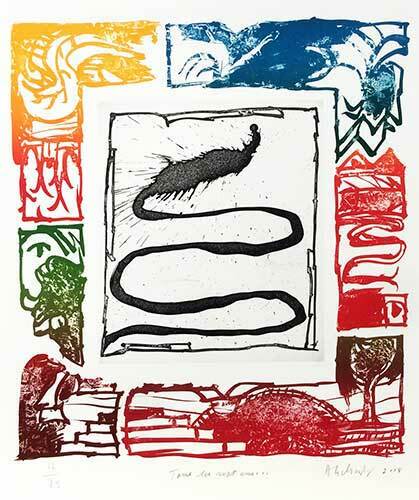 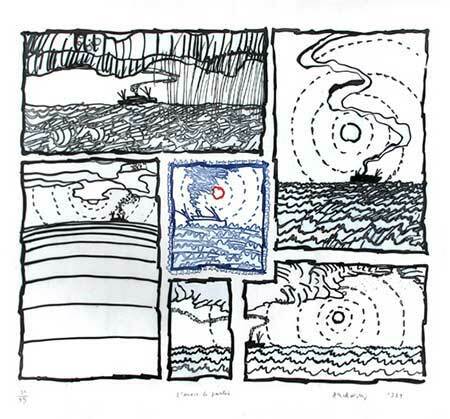 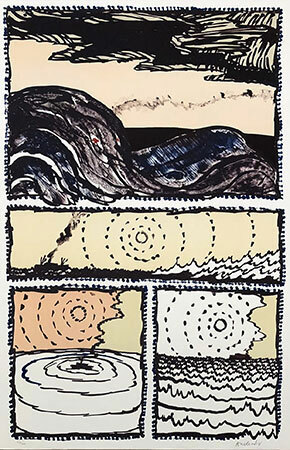 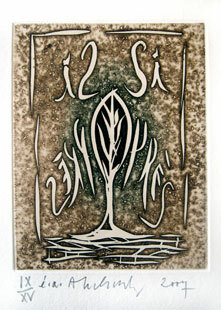 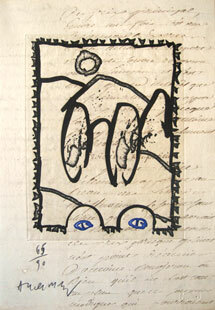 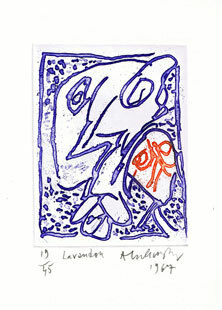 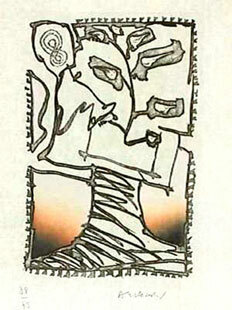 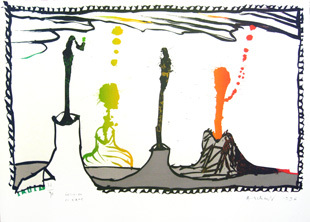 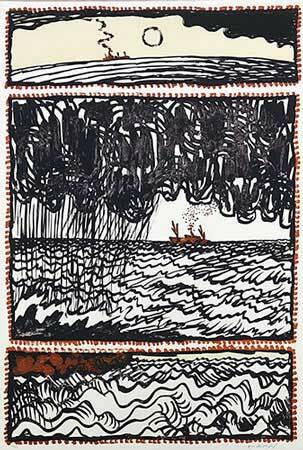 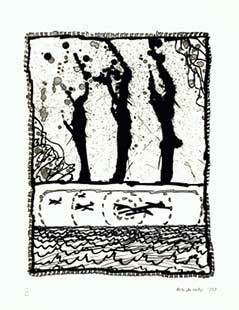 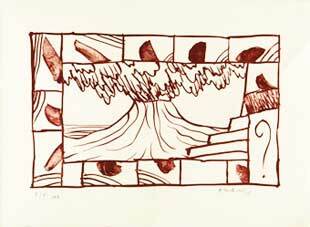 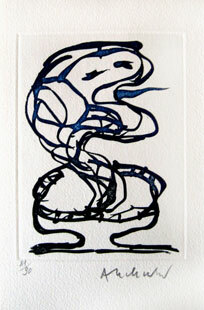 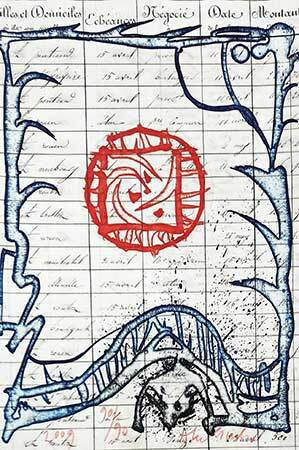 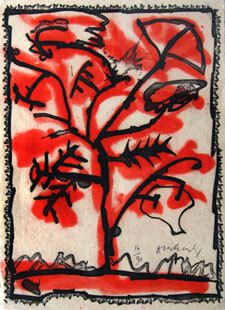 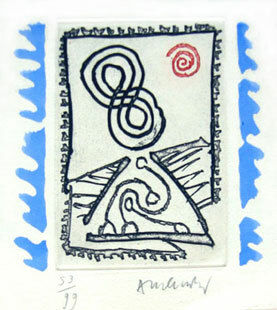 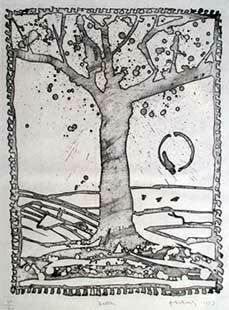 Here are the prints handsigned (lithographs, etchings or engravings) by Pierre Alechinsky that are presently for sale. 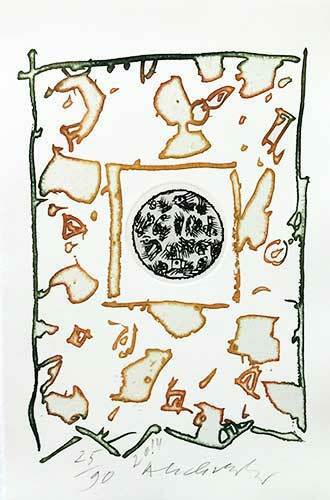 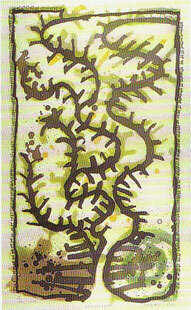 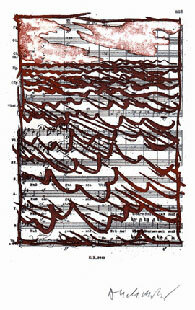 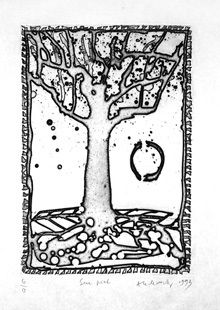 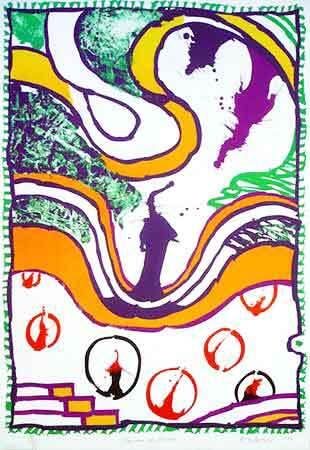 Click on the image to enlarge it and see the description of the print. 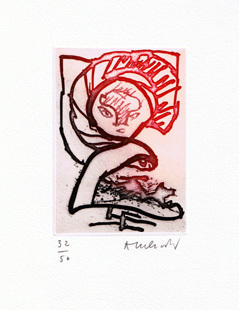 Unless otherwise specified all the prints shown on this page are signed by Alechinsky and are original. 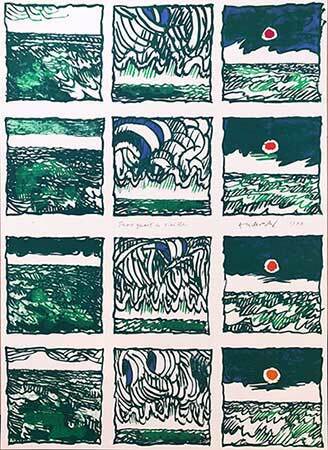 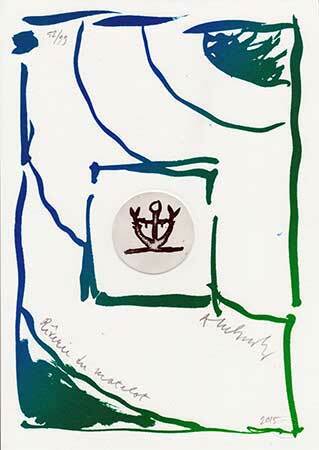 Pierre Alechinsky was born in Brussels in 1927. 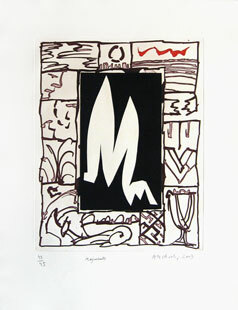 As from 1944, he attended the classes at the Brussels Higher School of Architecture Applied Arts. 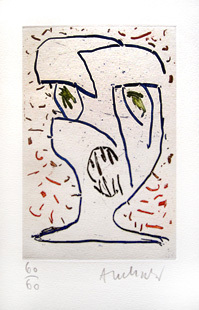 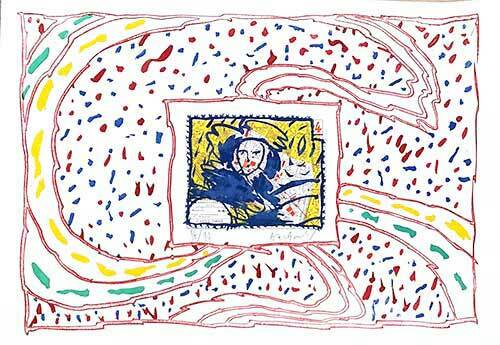 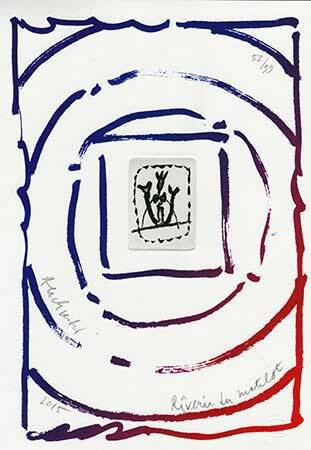 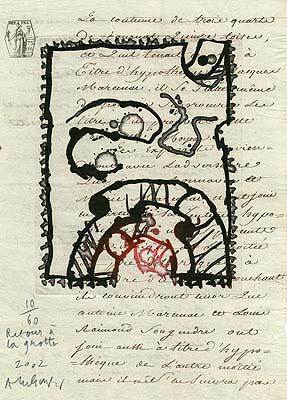 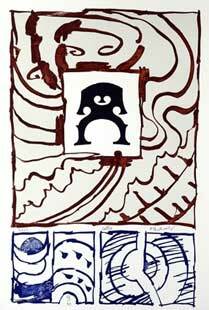 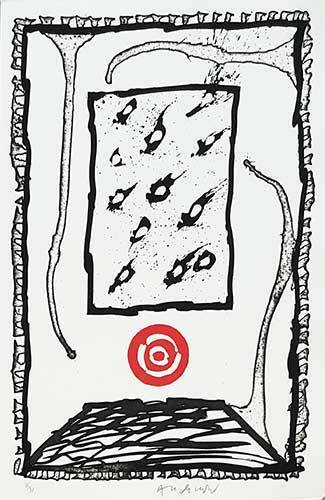 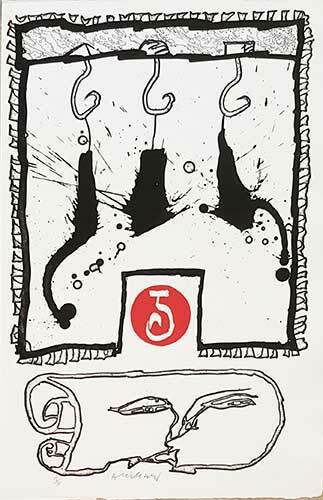 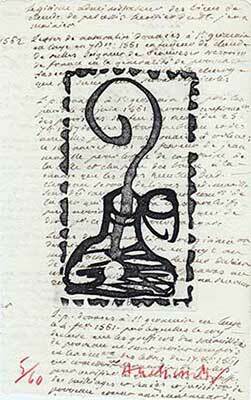 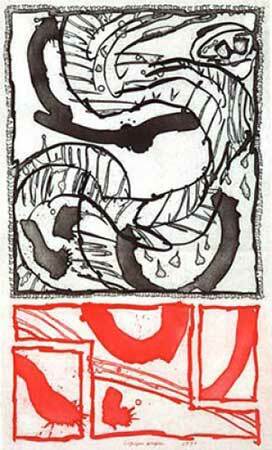 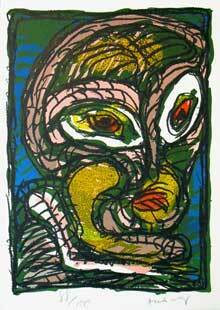 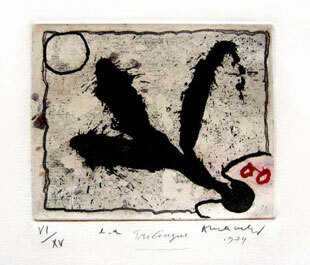 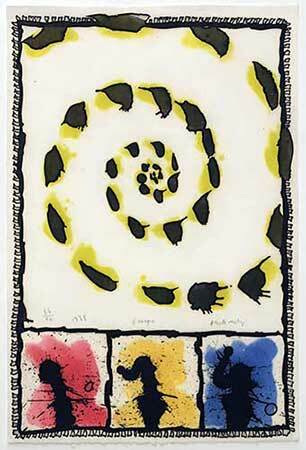 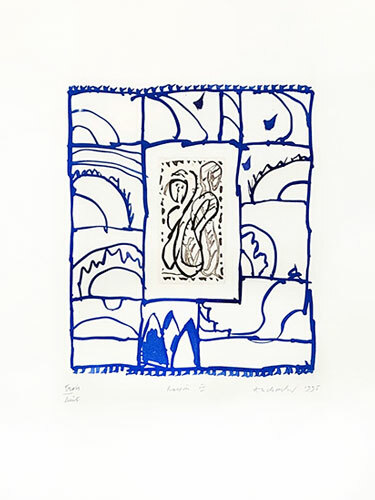 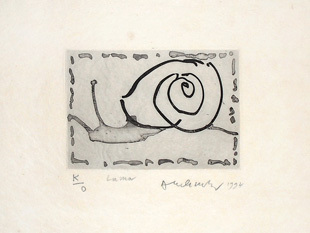 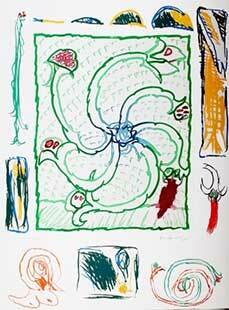 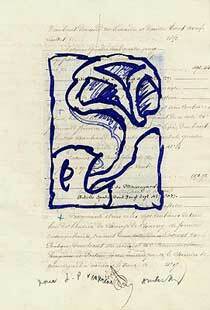 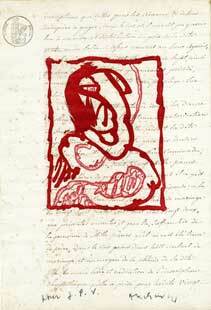 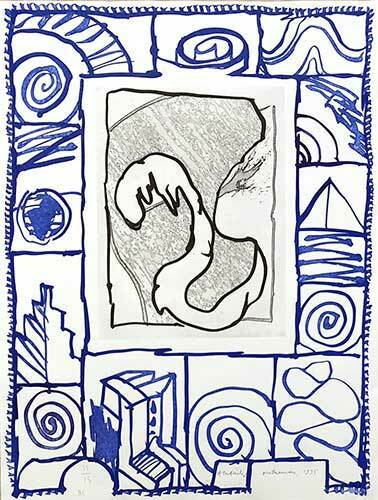 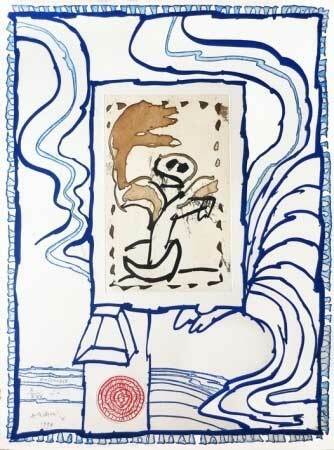 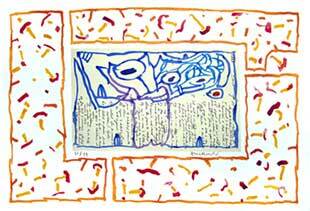 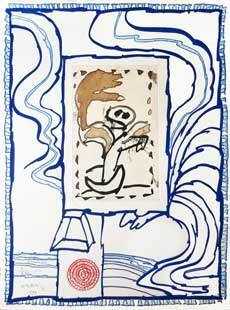 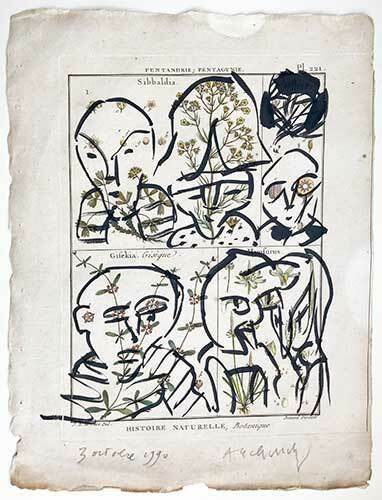 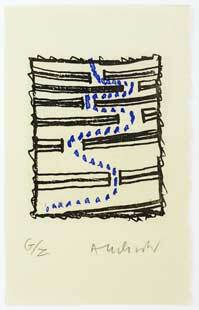 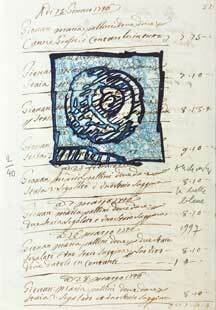 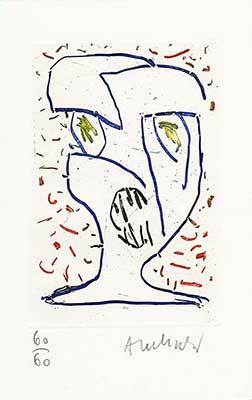 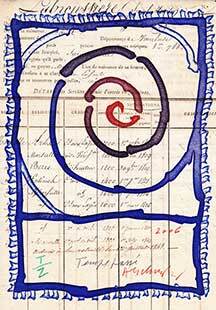 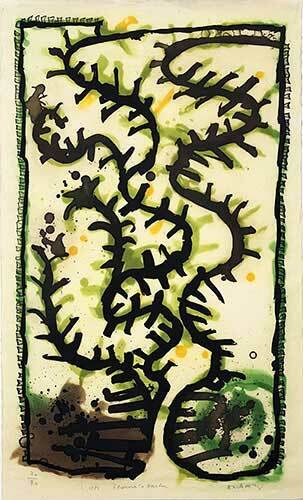 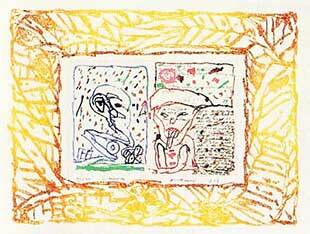 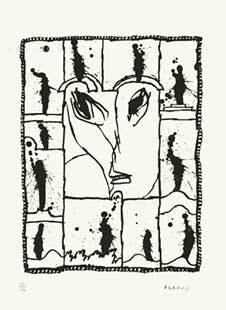 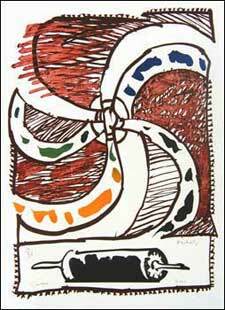 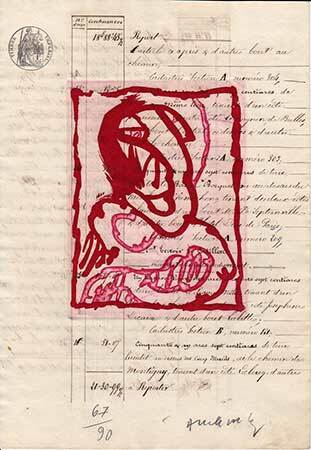 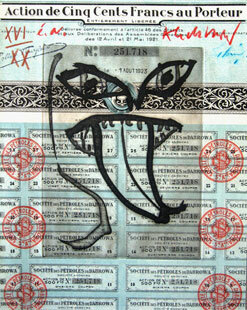 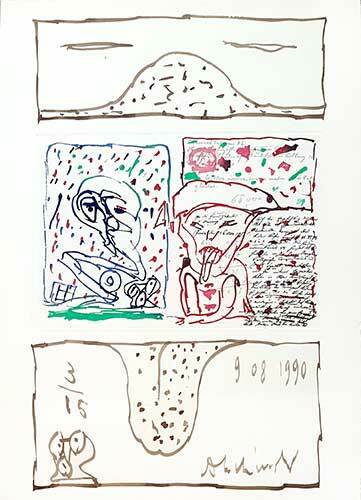 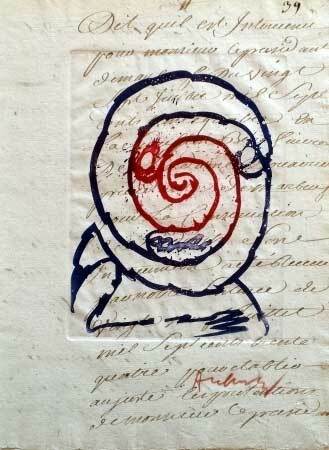 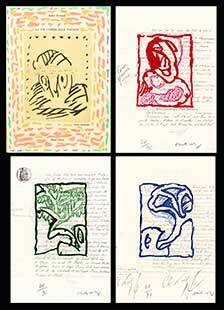 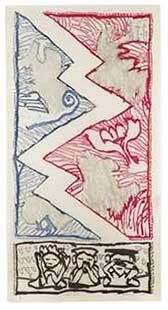 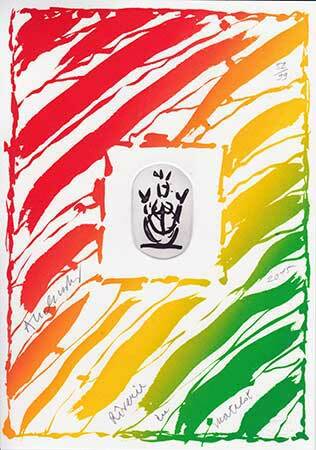 In 1949, Alechinsky met Christian Dotremont, he joined the Cobra group with Karel Appel and Asger Jorn. 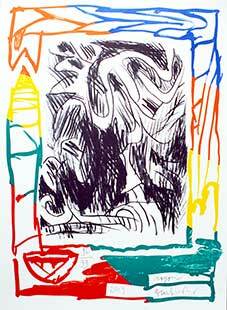 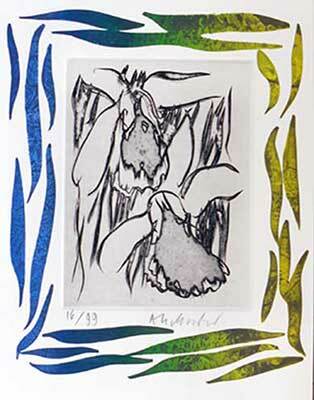 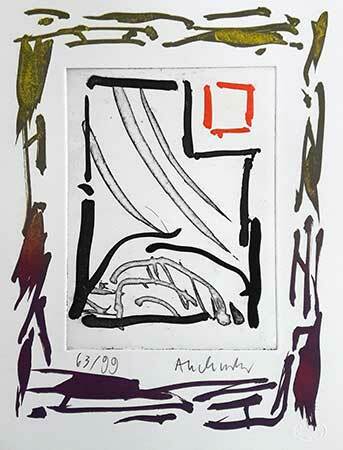 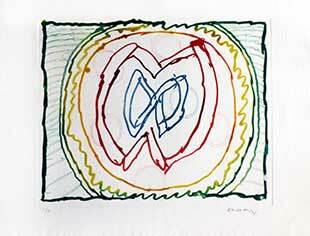 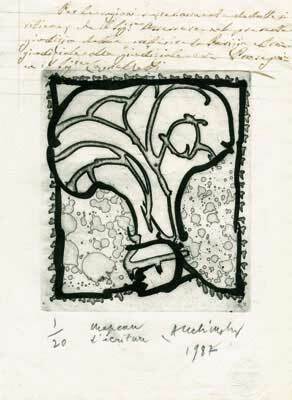 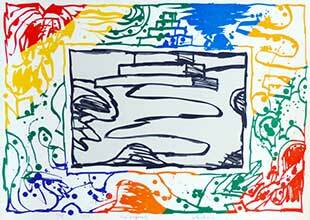 In the early fifties, Alechinsky began to study prints (etching and engraving) with Stanley William Hayter at the studio 17. 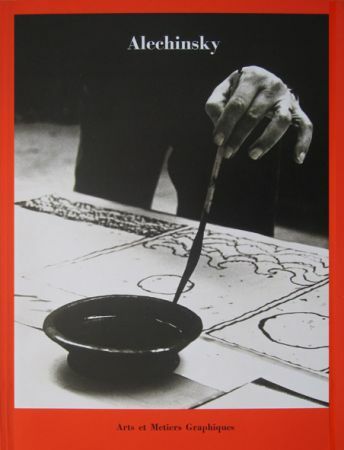 Alechinsky also learnt Japanese Calligraphy and made a film about it in 1952. 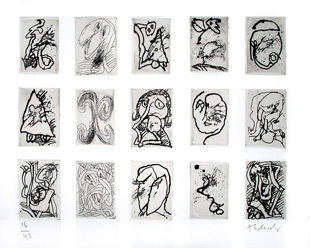 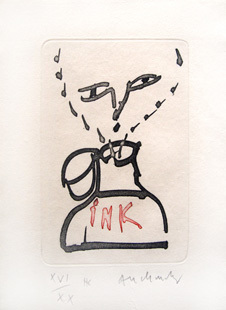 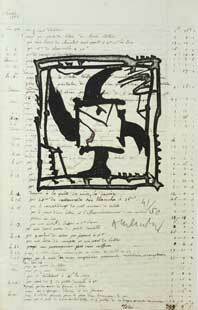 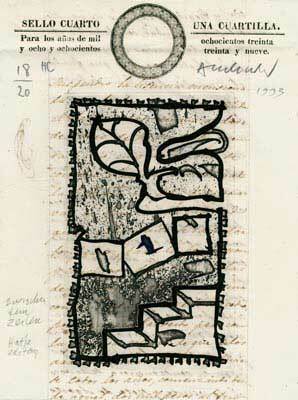 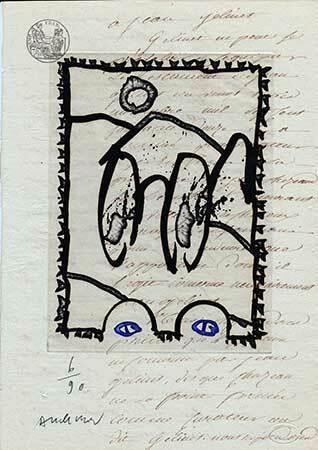 Alechinsky became friends with Giacometti, Bram van Velde, Victor Brauner and Wallace Ting. 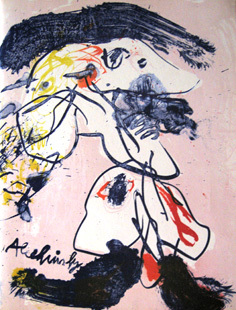 In 1955, Alechinsky held his first big exhibition at the Brussel Palais des Beaux Arts ; three years later his work was shown at the Contemporary Arts Institute in London. 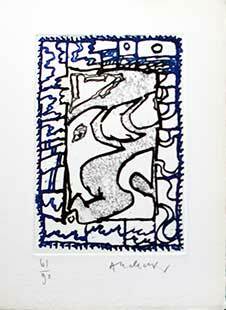 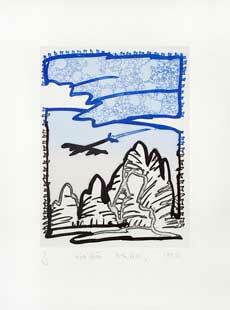 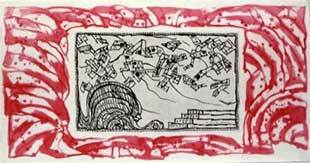 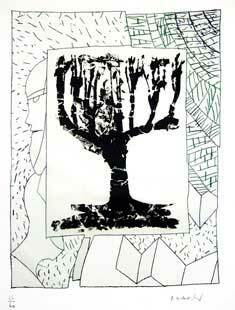 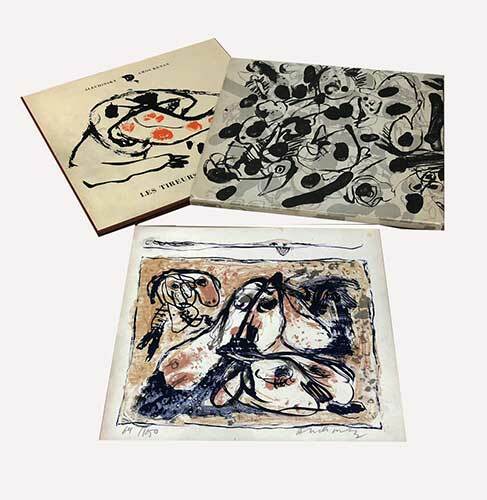 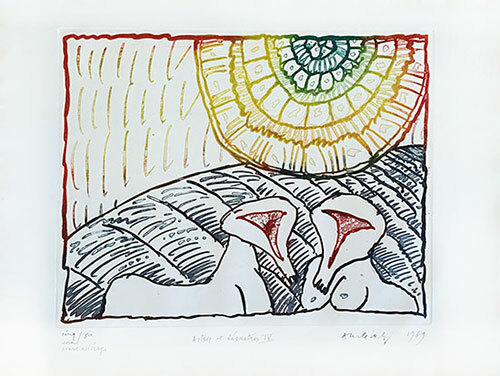 In the sixties the Lefebre Gallery in New York and the Galerie de France in Paris regularly showed Alechinsky's painting as well as his prints, lithographs or etchings. 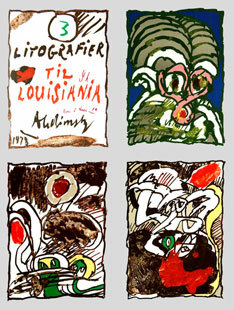 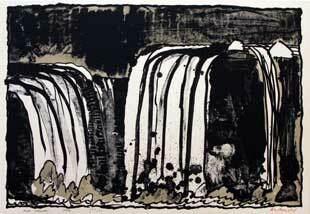 Numerous exhibitions of his work were held in the U.S. and in Holland. 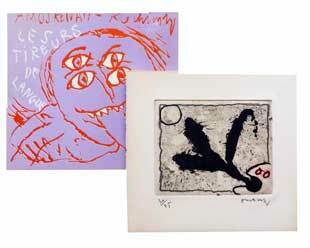 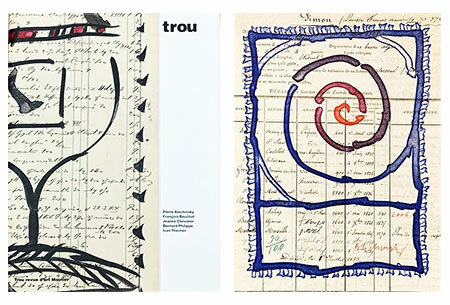 In 1969, the Brussels Palais des Beaux Arts held a big retrospective show of his work (paintings, prints), followed by the Louisiana Museum in Denmark, the Düsseldorf Kunstverein, and the Kunsthalle in Bremen. 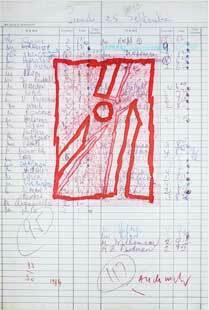 At the 1972 Venice Biennale, Alechinsky with Dotremont represented Belgium, and several Alechinsky exhibitions were held throughout the world (Belgium, Denmark, Switzerland, the U.S., Canada, Holland, Mexico). 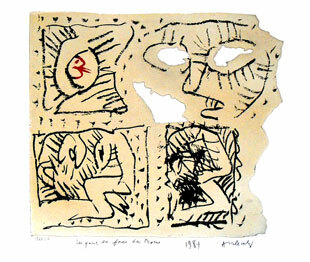 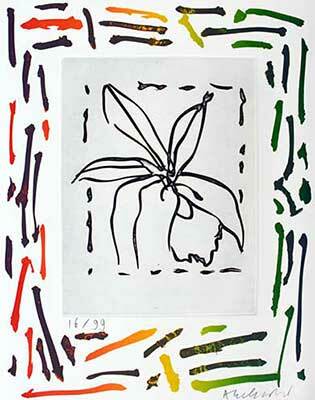 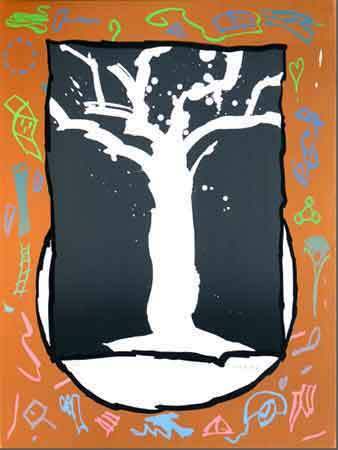 From 1983 to 1987, he taught painting at the Paris Ecole Nationale des Beaux-Arts. 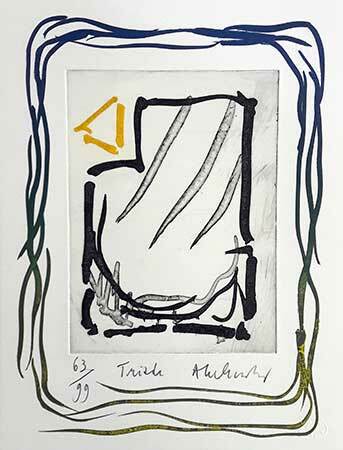 Alechinsky uses seasoned paper for his drawings and watercolours, also extending this practice for his prints, lithographs, etchings or engravings. 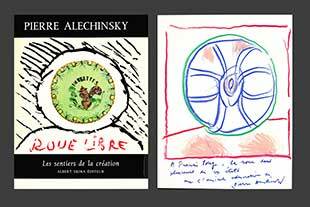 Writer as well as painter, Alechinsky has published numerous books : "titres et pains perdus" (Denoël 1965), "L'autre main" (Fata Morgana, 1988), "Lettre suit" (Gallimard 1992), "Balluchons et ricochets" (Gallimard 1994), "Rue de la verrerie" (l'Echoppe, 1997), "Le pinceau voyageur" (Gallimard 2002), "Des deux mains" (Mercure de France, 2004). 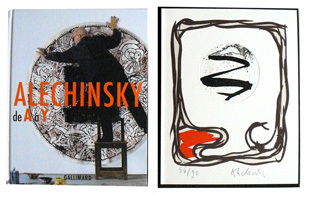 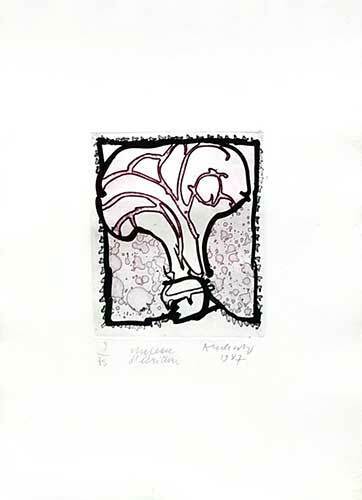 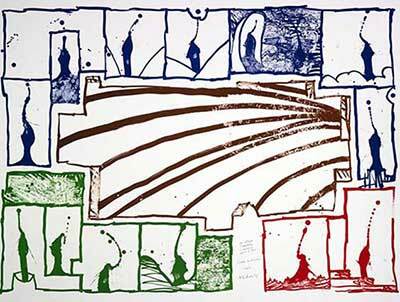 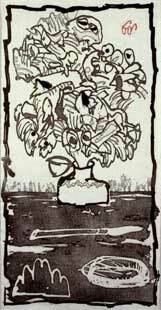 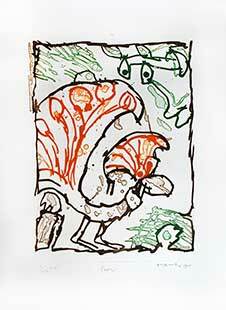 Alechinsky has explored all the techniques of print : etchings, engravings and lithographs and numerous shows have displayed his prints : large-scale etchings, multicoloured lithographs, engravings including impressed items of urban furniture, coloured aquatints. 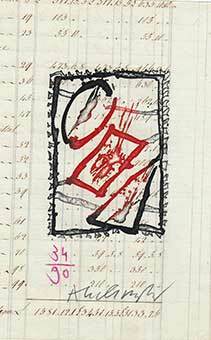 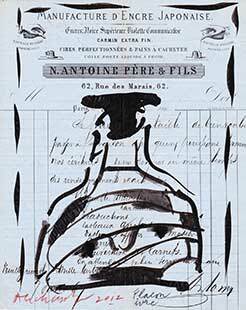 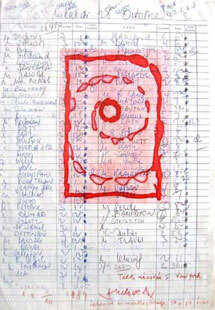 Among the different types of paper Alechinsky uses for his prints are legal forms and documents, invoice sheets, antique registers. 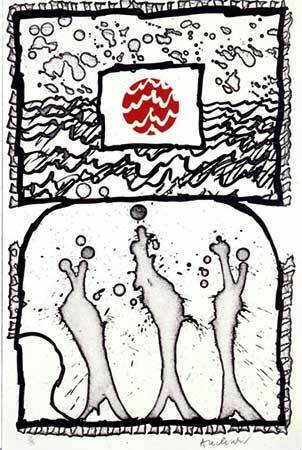 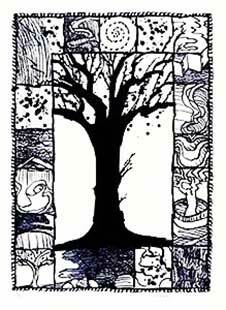 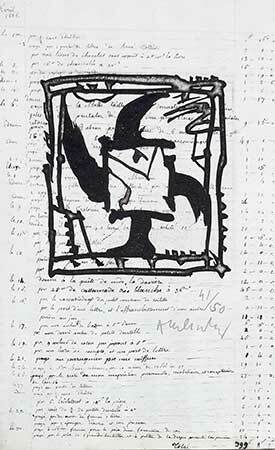 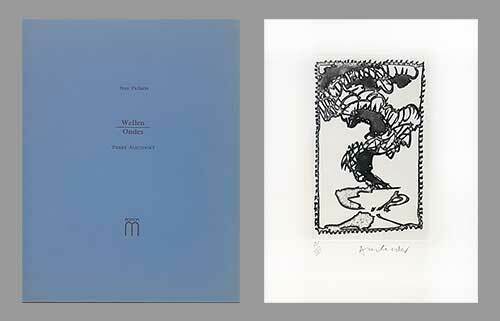 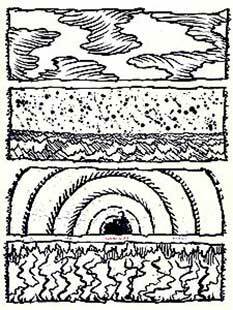 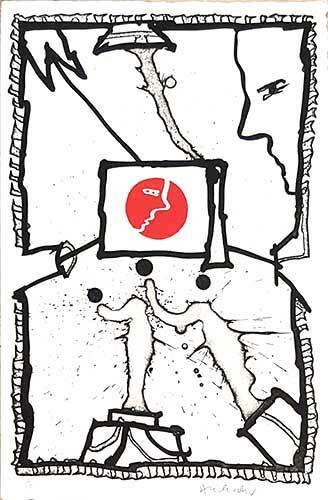 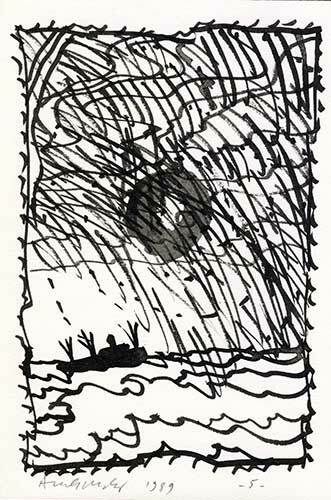 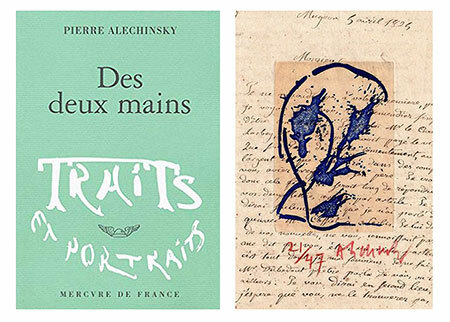 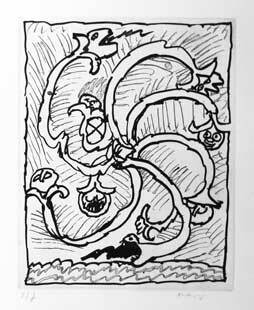 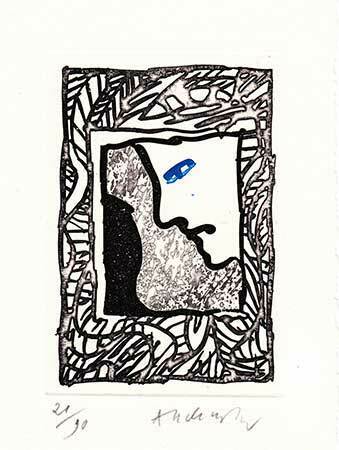 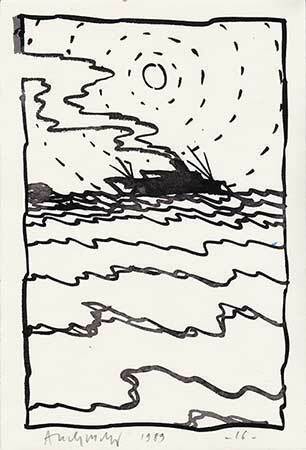 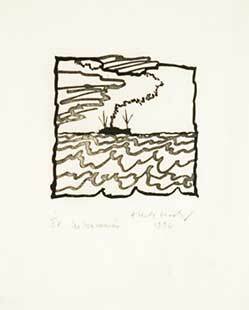 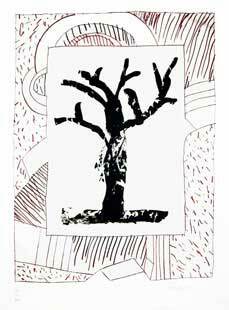 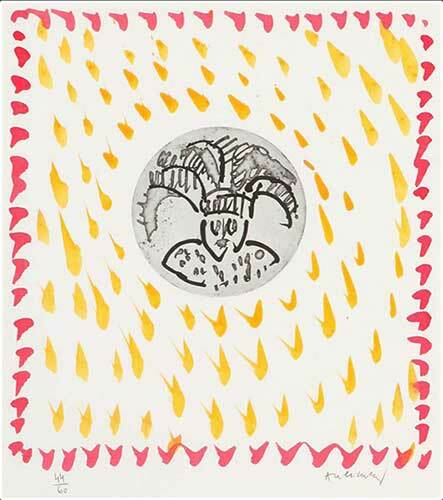 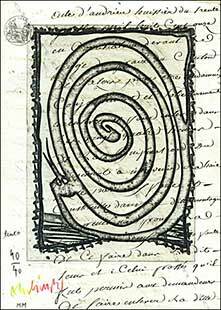 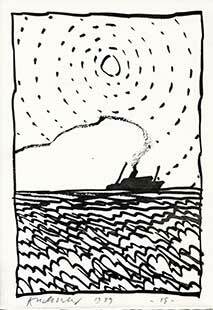 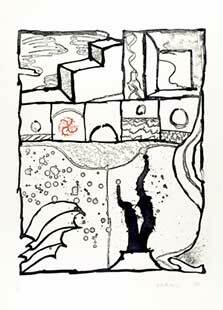 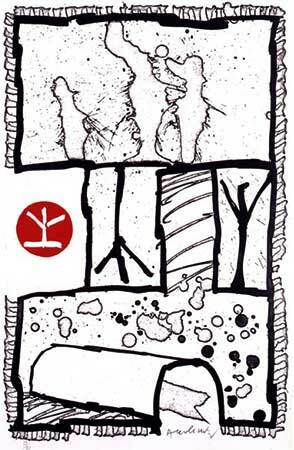 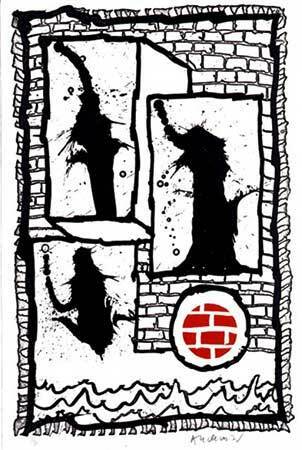 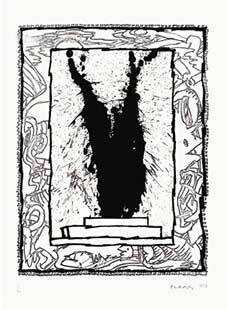 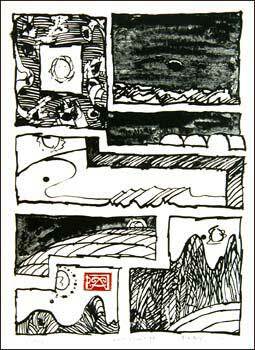 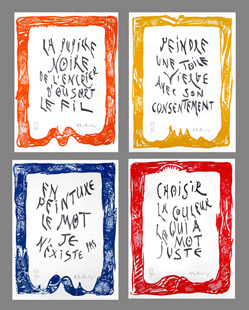 Alechinsky is also a book illustrator, usually employing etching or aquatint to illustrate the works of such contemporary writers and poets as Cioran, Cingria, Yves Bonnefoy, Michel Butor, André Frénaud, Jean Tardieu etc. 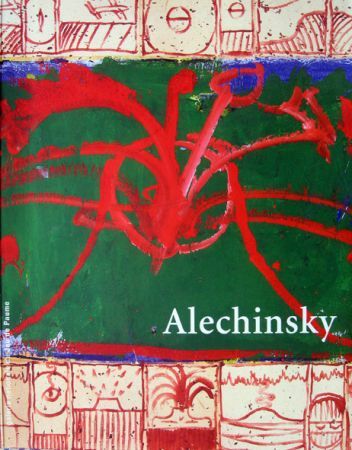 Alechinsky presently lives and works in Paris. 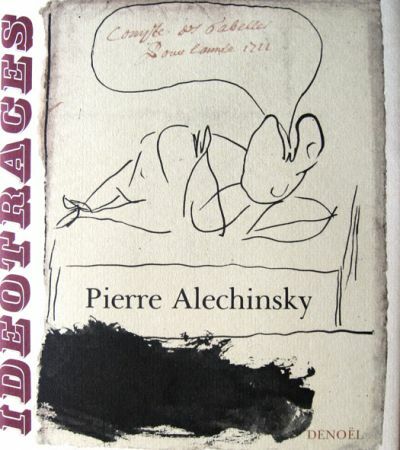 This catalogue raisonne for Pierre Alechinsky cover the period 1946 to 1972, so it is not complete for the whole graphics work of Alechinsky. 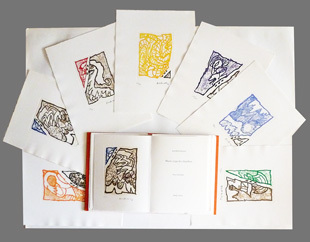 More than 600 original prints are reproduced here : lithographs, etchings, woodcuts, posters, linocuts and all the prints that Alechinsky made for illustrated books. 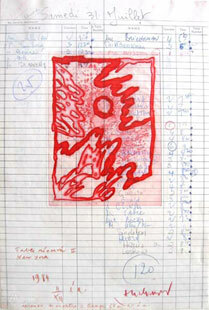 This catalogue had been made and published by Yves Rivière. 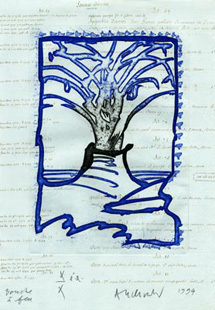 "Of course, when one is faced with a canvas, one is no longer alone, and the sense of solitude diminishes. 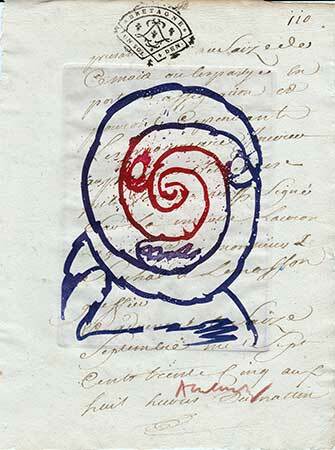 This can be an agreeable passage of time. 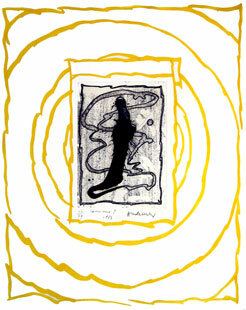 In fact, solitude then becomes a kind of companion". 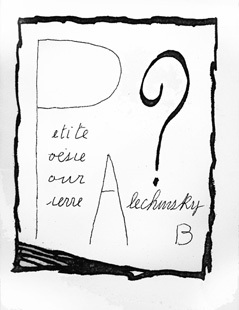 - Alechinsky. 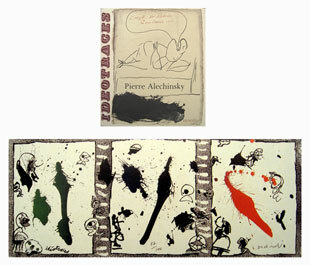 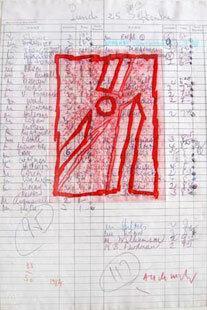 Catalogue of an exhibition Pierre Alechinsky in the Galerie Nationale du Jeu de Paume in Paris in 1998. 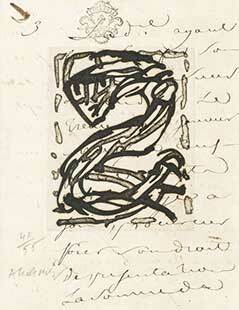 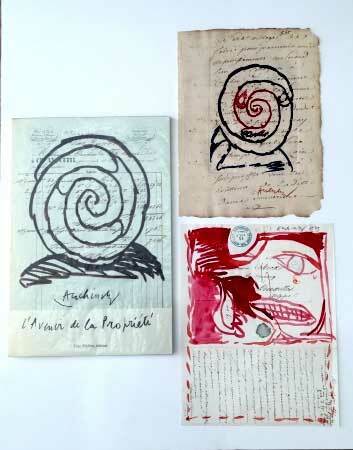 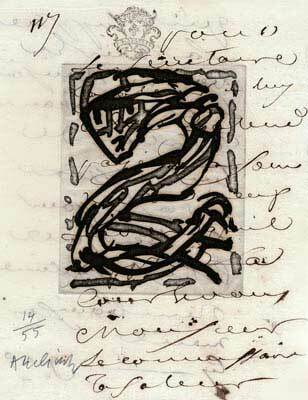 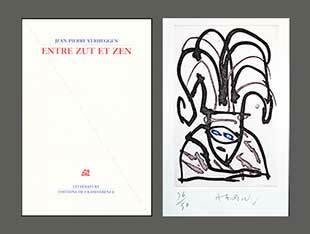 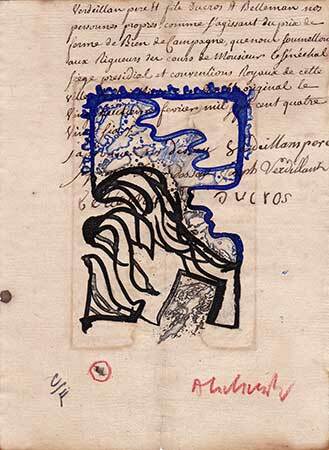 Texts from Alain Robbe-Grillet (Chemin faisant) and Pierre Daix (Pierre Alechinsky en son époque). 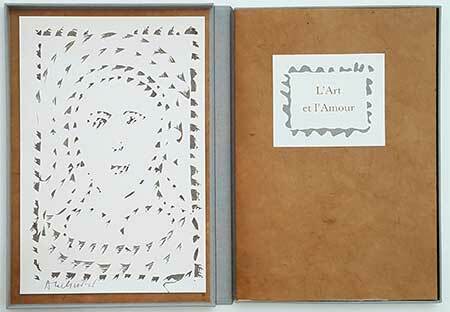 Probably the most complete book to discover the paintings, gouaches or inks by the artist. 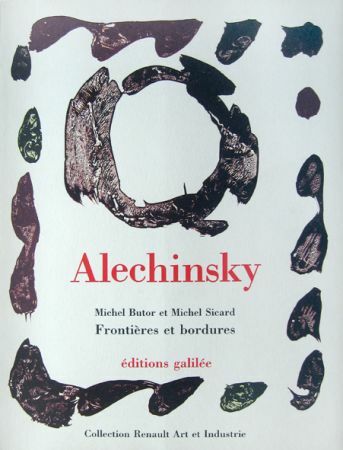 - Alechinsky, idéotraces. 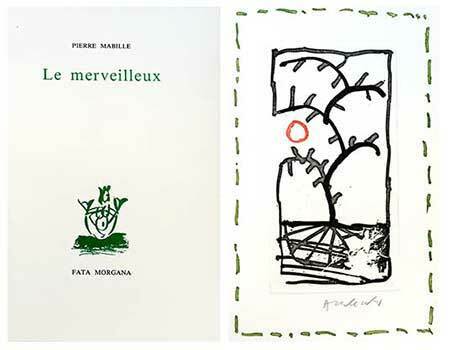 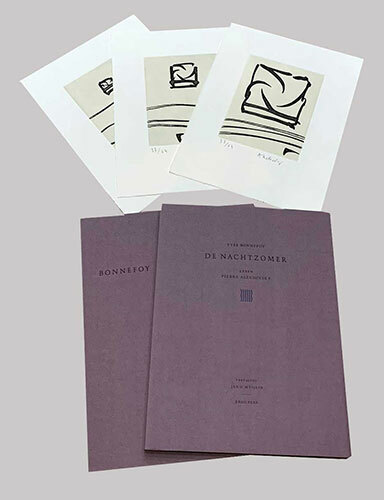 Published by Denoël in 1966, this book reproduced about 100 inks on paper from Pierre Alechinsky who also write the foreword of this book. 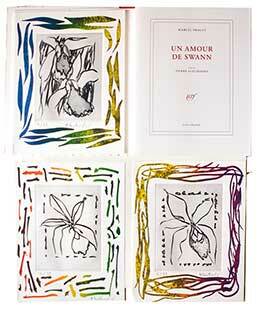 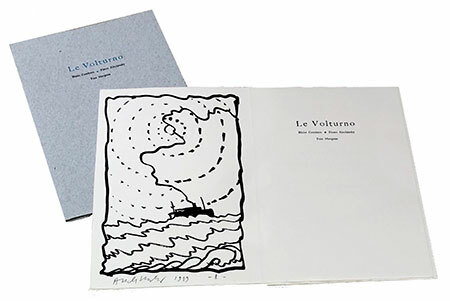 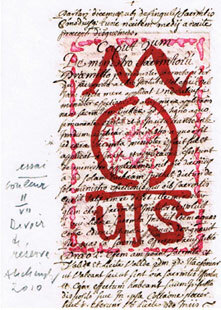 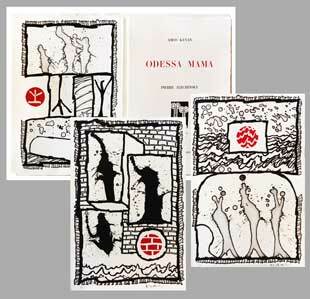 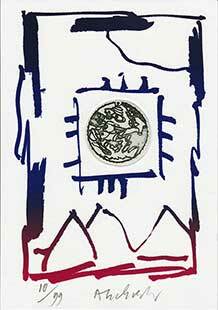 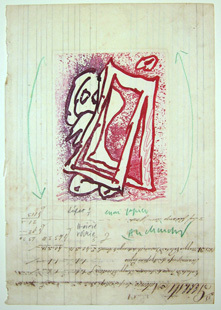 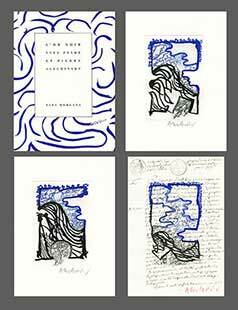 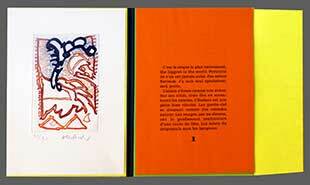 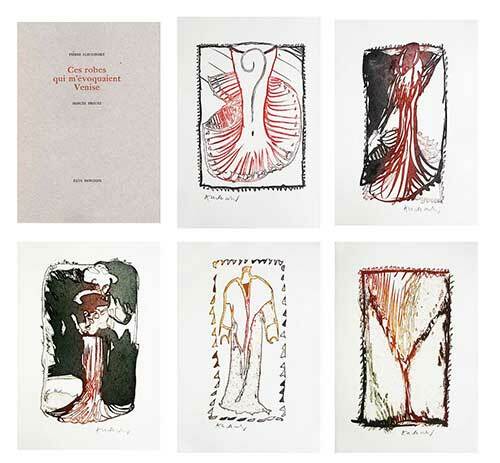 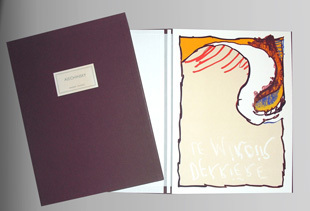 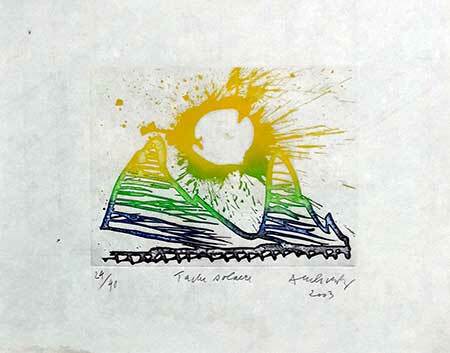 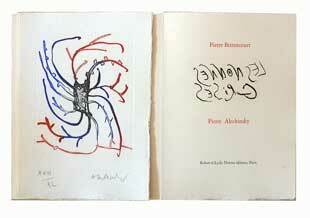 Edition of the book at 3000 copies, the 100 first are with an original lithograph signed by Alechinsky. 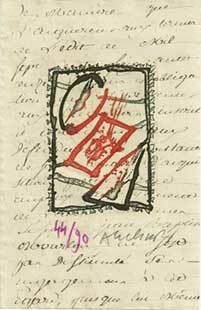 - Alechinsky. 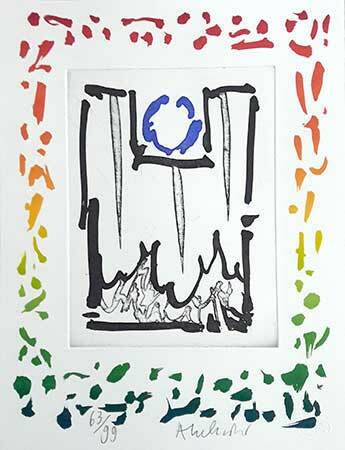 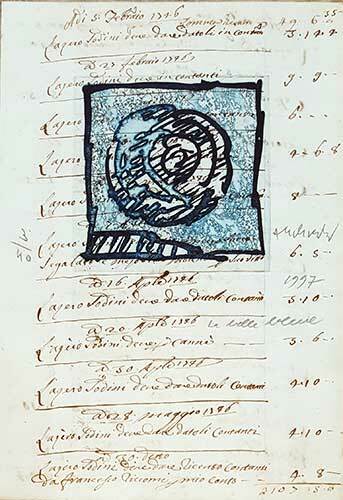 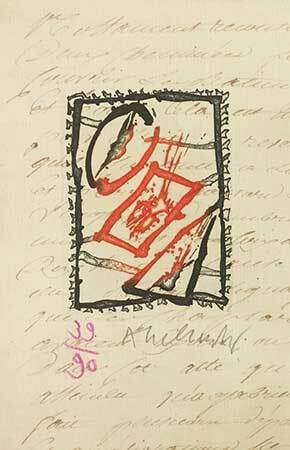 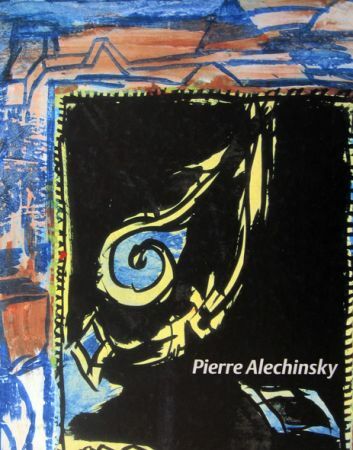 Catalogue of an exhibition Pierre Alechinsky in the Art Museum of Paris in 1975, exhibition devoted to the acrylic painting that Alechinsky use because of the freedom he can have with this technic. 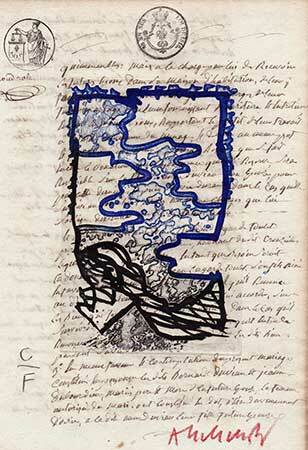 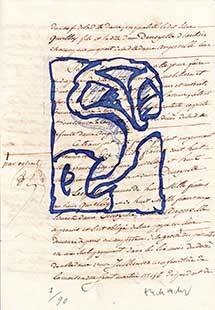 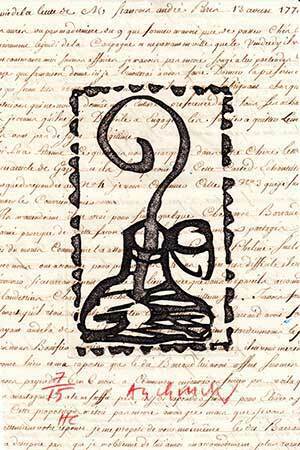 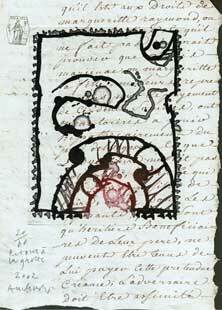 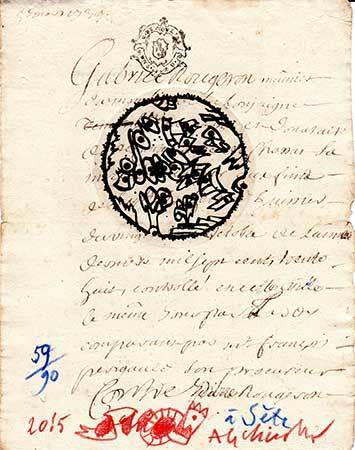 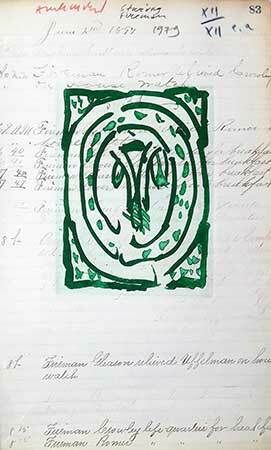 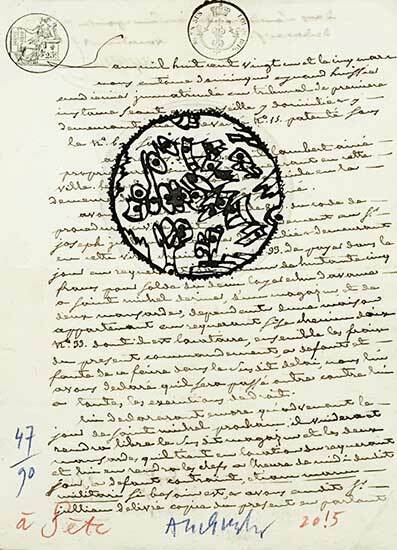 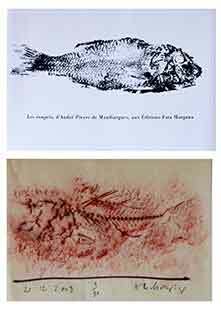 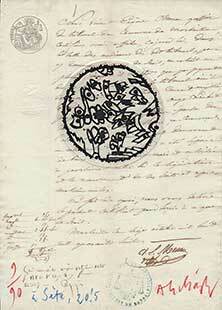 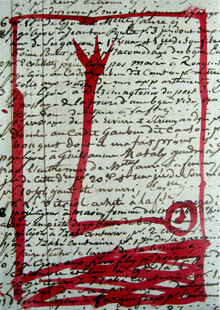 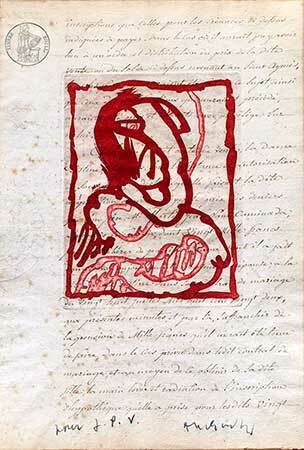 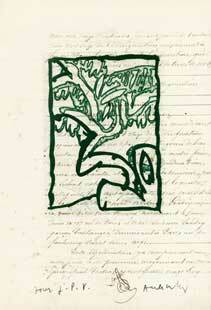 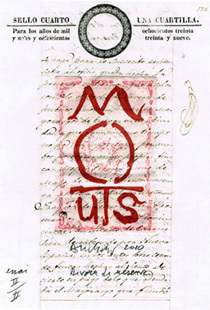 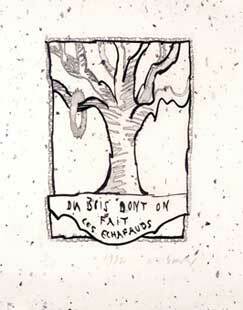 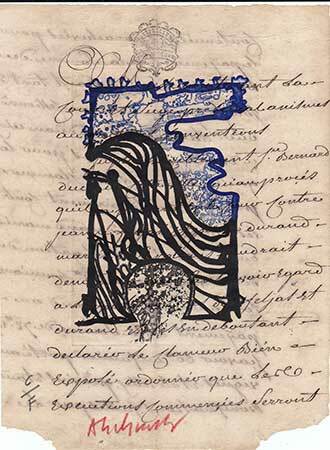 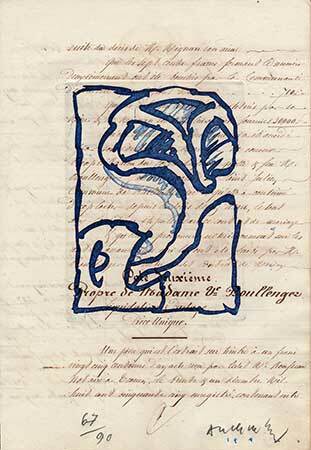 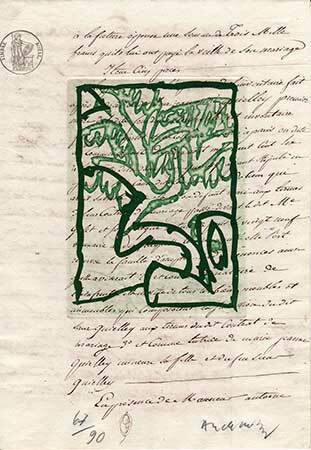 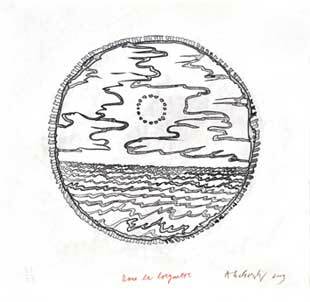 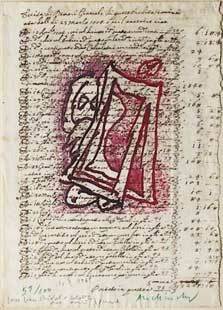 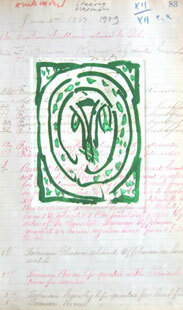 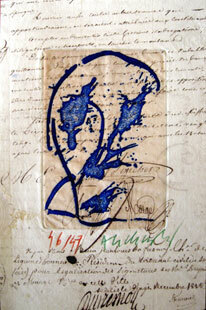 Text of Jacques Lassaigne, about 100 paintings are here reproduced. 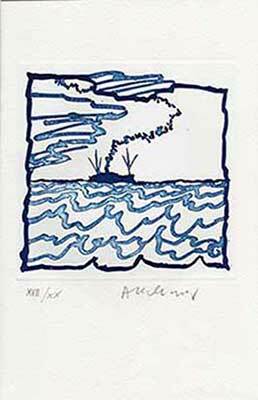 - Frontière et bordures. 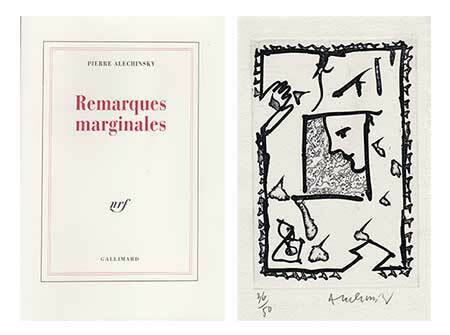 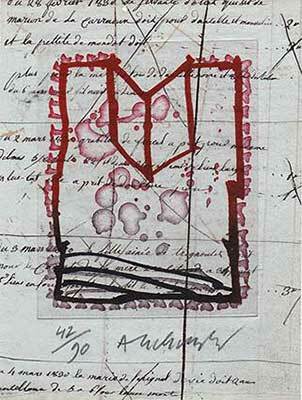 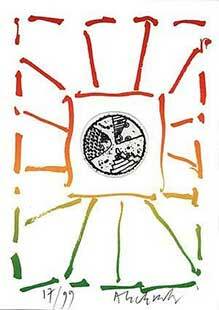 Catalogue of an exhibition Pierre Alechinsky in the Abbaye of Senanque in 1984. 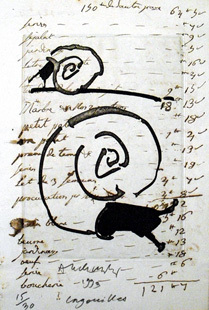 Texts from Michel Butor and Michel Sicard. 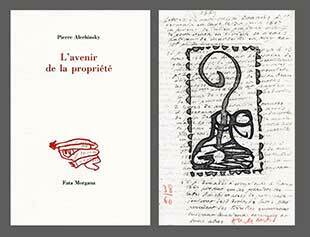 - Pierre Alechinsky, centres et marges. 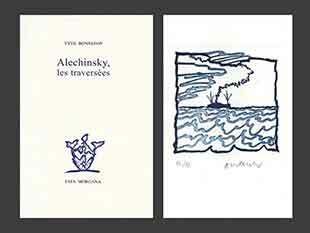 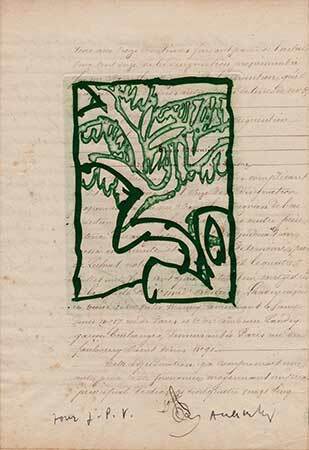 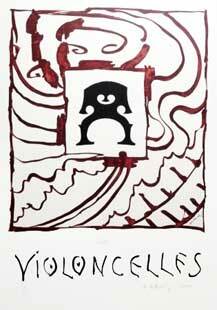 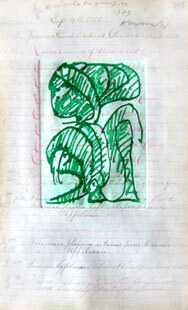 Very interesting book about the marginal drawings that Alechinsky add to his paintings, drawings or prints. 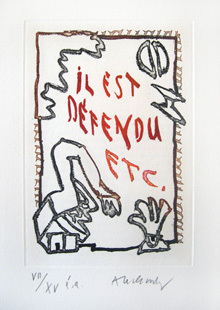 Dialogue between Michael Gibson and Pierre Alechinsky where the artist explain these additions, notes, subtitles, marginal remarks. 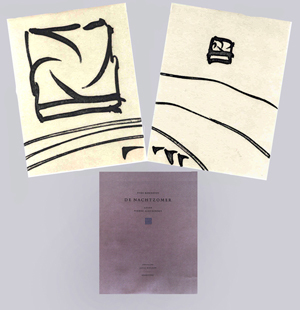 Alechinky has also written several books, you can find some description of some of them and some important catalogues of exhibition while clicking on certain images of prints for sale or already sold.